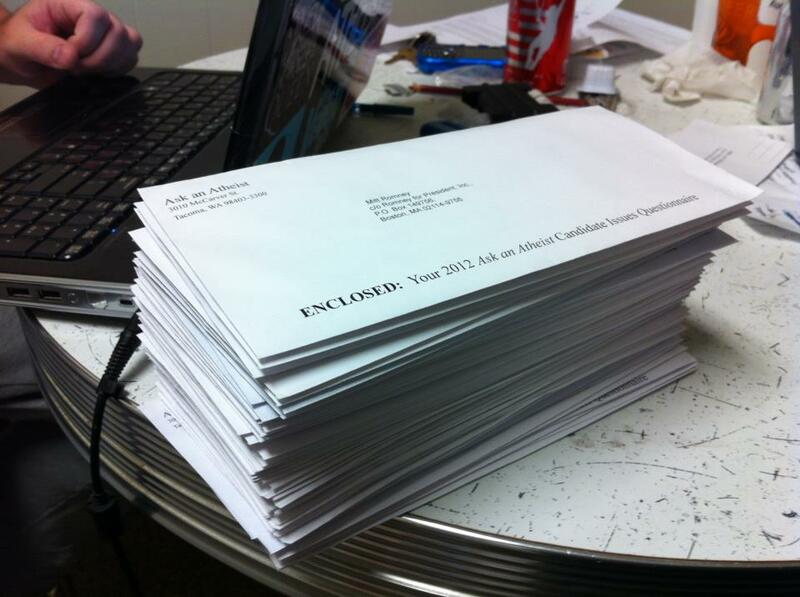 The official 2012 Ask an Atheist Candidate Questionnaire has been mailed out to 51 people seeking office for President, U.S. Congress and statewide office here in Washington state. Whew! No, we haven’t started endorsing candidate or parties for political office, but we figured it was time that our candidates started being asked some often neglected questions that are important to the atheist/skeptic/rationalist communities. Does the candidate accept the scientific consensus on evolutionary theory? Does the candidate agree that no link exists between autism and childhood vaccination? Does the candidate subscribe to Birther or Truther conspiracy theories? Does the candidate support a strong wall of separation between church and state? Will the candidate go on record and agree that atheists are just as capable of living happy, fulfilling and meaningful lives as any religious believer? We’ve asked all these questions and more, and we need your help to ensure that we get answers! Please take a few minutes call the candidates below and let them know that you want to know where they stand publicly on these issues. 2.) Don’t argue with the person who answers the phone. Remember, the more of us that contact the campaign, the more likely we are to get a response! We need to assert that we’re a constituency that they need to respect and respond to! And if you’d like to use our questionnaire in your state, feel free to send it under the banner of your own organization and send us any response you get! *Candidates chosen were — at the time the questionnaire was written – slated to appear on at least one U.S. state ballot and had a mailing address. Never thought I would send a letter to Rossanne Barr. I never thought I’d be hoping to get a letter back FROM Roseanne Barr.